In Ithe past, the working distance (WD) of off-axis parabolic mirrors was limited to the two-axis diamond-turning lathe’s swing diameter. Today, II-VI routinely produces long working distance parabolas with any turning angle using slow tool servo technology. Like standard working distance off-axis parabolic mirrors, long working distance mirrors are made from copper substrates (either tilted or flat) which withstand extremely high laser powers and industrial environments. 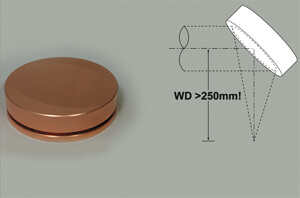 These mirrors provide diffraction-limited focusing when properly mounted and aligned. Also, copper mirrors are coated to provide greater reflectivity. II-VI designs parabolic mirrors to reflect and focus the laser beam through 90° (standard) or any other convenient angle. Custom-designed features, such as water cooling and nonstandard mounting configurations, are available upon request. Working distances that exceed standard capabilities of two-axis machines. Excellent figure accuracy < 0.5µm. Excellent surface roughness < 0.6 nm. Large-diameter optics up to 250 mm.